Pampa hosts the Top 'O Texas Rodeo each year in July, which brings competitors from Texas and the surrounding states to Gray County. The White Deer Land Company Museum, which showcases ranching exhibits, is located in downtown Pampa. In 1888, the Santa Fe Railroad was constructed through the area where Pampa would be established. A rail station and telegraph office was built, and the townsite was laid out by George Tyng, manager of the White Deer Lands ranch. The town was first called "Glasgow", then "Sutton", and then the name was changed to "Pampa" after the pampas grasslands of South America at Mr. Tyng's suggestion. Timothy Dwight Hobart, a native of Vermont, sold plots of land for the town only to people who agreed to settle there and develop the land, and Pampa soon became a center for agriculture. Gas and oil were discovered in the Texas Panhandle in 1916. 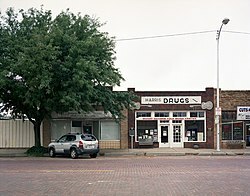 Pampa prospered greatly in the resulting oil boom, and the Gray County seat of government was moved in 1928 from Lefors to Pampa. By the 1920s, Pampa was linked by rail to Hemphill County and Clinton, Oklahoma, through the combination of two similarly-named companies, the Clinton, Oklahoma, and Western Railroad Company and the Clinton-Oklahoma-Western Railroad Company of Texas. Both of these companies were soon leased and purchased by the Panhandle and Santa Fe Railway, which held them until disestablishment in 1965. Pampa is located in northwestern Gray County. According to the United States Census Bureau, the city has a total land area of 9.0 square miles (23.2 km2), all land. U.S. Route 60 passes through Pampa, leading northeast 46 miles (74 km) to Canadian and southwest 54 miles (87 km) to Amarillo. Texas State Highway 70 crosses US 60 in the southwest part of Pampa and leads north 62 miles (100 km) to Perryton and south 24 miles (39 km) to Interstate 40. As of the census of 2010, there were 17,994 residents, a 0.6% increase from 2000. The population density was 2,008.3 people per square mile (775.6/km²). There were 8,492 housing units. The racial makeup of the city was 80.9% White, 3.3% Black, 0.8% American Indian or Alaskian Native, 0.4% Asian, had 2.6% reporting 2 or more races. Hispanic or Latino of any race were 26% of the population. There were 7,123 households (2006–2010) with 2.6 persons per household. Persons under 18 years of age accounted for 27%, and under 5 years of age accounted for 8.1%. Persons over age 65 accounted for 16% of the population. The median household income was $40,358, with the per capita income in the past 12 months (2010 dollars) 2006-2010 being $22,025. The home ownership rate (2006–2010) was 76.2%, with the median value of owner-occupied housing units was $65,300. As of the census of 2000, there were 17,887 people, 7,387 households, and 5,074 families residing in the city. The population density was 2,050.0 people per square mile (791.1/km²). There were 8,785 housing units at an average density of 1,006.8 per square mile (388.5/km²). The racial makeup of the city was 83.69% White, 3.85% African American, 1.07% Native American, 0.41% Asian, 0.03% Pacific Islander, 8.22% from other races, and 2.73% from two or more races. Hispanic or Latino of any race were 13.72% of the population. There were 7,387 households out of which 30.4% had children under the age of 18 living with them, 55.9% were married couples living together, 9.8% had a female householder with no husband present, and 31.3% were non-families. 28.8% of all households were made up of individuals and 15.3% had someone living alone who was 65 years of age or older. The average household size was 2.39 and the average family size was 2.94. In the city, the population was spread out with 25.9% under the age of 18, 7.4% from 18 to 24, 25.4% from 25 to 44, 22.6% from 45 to 64, and 18.7% who were 65 years of age or older. The median age was 39 years. For every 100 females, there were 91.0 males. For every 100 females age 18 and over, there were 86.8 males. The median income for a household in the city was $31,213, and the median income for a family was $39,810. Males had a median income of $32,717 versus $20,492 for females. The per capita income for the city was $17,791. About 12.1% of families and 14.8% of the population were below the poverty line, including 19.7% of those under age 18 and 9.4% of those age 65 or over. The Pampa News is a daily newspaper published in Pampa. It serves Pampa and the surrounding areas of Gray County. The paper is published daily except Sundays, Mondays and major holidays. The daily circulation is about 3,600. The city is served by the Pampa Independent School District. The school district administers four elementary schools (Austin, Lamar, Travis and Wilson) and one junior high school. Pampa High School and the non-traditional Pampa Learning Center are also part of the school system. Pampa is also served by the Pampa Center branch of Clarendon College. The Lovett Memorial Library was built on the entire west half of the 100 block of North Houston Street. The building was dedicated on 18 January 1955. In 1985 the Harrington Foundation of Amarillo paid for the computerization of library records, joining the library for the first time into a consortium with most of the public libraries in the Panhandle. By the mid-1990s Lovett Library was showing its age, and it was furthermore not compliant with the Americans for Disabilities Act. In October 1995 it was announced that Mrs. Ruth Ann Holland has left $500,000 to the Library Foundation in her will. In 1996 the Lovett Library Foundation' which managed the Holland bequest and several other substantial bequests, announced that a plan was being made to extensive renovate the old building. In January 1998 the library staff along with all books and much equipment moved from the Houston Street facility to the old B. M. Baker school on the south side, where the library was set up in the cafeteria and classroom annex in the south part of the school complex. This freed the old building on Houston Street for renovation. The children's area was moved to the second floor; a bridge was built between the second floor facility and other children's rooms in the south part of the building; an elevator was installed; new shelves, lighting, and ceiling tiles were installed; and the building was made completely ADA compliant. In June 2003 it was announced that R. L. Franklin, prominent rancher of Pampa, would donate two statues to the library to honor the 50th anniversary of the opening of the building in January 1955. One statue, by Don Ray of Channing, represents a seated woman reading to a child; this is erected in front of the library. Another statue representing a Pioneer Woman was by David Frech of New York; this was placed in the library's Reading Garden. Both statues were dedicated to four local women, including the donor's mother, each of whom had a long involvement with the library. The statues were dedicated on 9 January 2005, and at one of the dedicatory events the author Elmer Kelton was the guest speaker. On June 8, 1995, a violent tornado hit the industrial section on the west side of Pampa, destroying or damaging about 250 businesses and homes. It resulted in $30 million in damage and was the costliest and the most destructive tornado on record for this town. It had a three-mile path and was two hundred yards wide. At its peak, it was rated an F4 on the Fujita Scale. Black Bart, retired professional wrestler. Duane Lee Chapman, or Dog the Bounty Hunter, was raised in Pampa. Woody Guthrie, the songwriter, moved to Pampa with his father Charles Guthrie and attended high school there briefly. Zach Thomas, retired National Football League linebacker. ^ a b "Geographic Identifiers: 2010 Demographic Profile Data (G001): Pampa city, Texas". American Factfinder. U.S. Census Bureau. Retrieved March 15, 2017. ^ "The Pampa News". The Pampa News. Archived from the original on February 4, 2013. Retrieved August 21, 2012. ^ "Texas' Pampa News announces editor". Vocus, Inc. Retrieved August 20, 2012. ^ "Climatography of the United States NO.20" (PDF). National Oceanic and Atmospheric Administration. Retrieved February 13, 2011. Wikivoyage has a travel guide for Pampa. This page was last edited on 16 December 2018, at 14:36 (UTC).